Our story finds the Knights of the Rose returning home after five years away at war to changing times at Castle Rose. Most notably, Princess Hannah (Katie Birtill) and Lady Isabel (Rebekah Lowings) are all grown up, which stirs the loins of the returning knights. Before long the ladies find themselves with multiple possible suitors. Sir Hugo (Oliver Saville) is keen to settle down and Princess Hannah looks like a good match; unfortunately, his best friend Sir Palomon (Chris Cowley) might not be ready for a medieval life of carpet slippers just yet and is similarly enchanted by the beautiful but spoilt princess. These romantic entanglements will be further complicated as the Knights of the Rose‘s days of war might not be behind them. Created by Jennifer Marsden and directed/choreographed by Racky Plews, Knights of the Rose tells its tale by mining literary references from Chaucer, Shakespeare, Marlowe, Byron, Kipling etc. It throws something of a curveball into proceedings as, after a brief intro from our narrator Knight-in-waiting John (Ruben Van Keer), the returning knights launch into a rousing take on ‘Blaze of Glory’ which although stepped in wild west imagery (Jon Bon Jovi wrote the song for the ‘Young Guns’ film) translates well to the Arthurian setting and proves a surprisingly effective fit. The Knights attack the song with gusto and it’s time to buckle up for a very enjoyable ride as Knights of the Rose proceeds to mash up classical literature with power balladry to great effect. As the story unfolds Bon Jovi tunes are to the fore alongside songs by Uriah Heep, Black Sabbath, No Doubt and R.E.M. occasionally this resulted in something of a cheese fest with renditions of ‘Hero’ and ‘He Ain’t Heavy’ bringing good-natured laughter and the odd groan from an audience who were obviously happy to enter into the spirit of proceedings. Musical highlights are plentiful with the Jim Steinman penned ‘Is Nothing Sacred’ and Muse’s ‘Survival’ outstanding. KOTR _ Photographer Mark Dawson_Cast L-R Ian Gareth Jones-Chris Cowley-Andy Moss-Tom Bales-Matt Thorpe-Oliver Savile. The production features an inventive set design that makes effective use of the Arts Theatre stage with a basic two room castle design that finds the hard-rockin' band partially hidden from view in the cloisters. 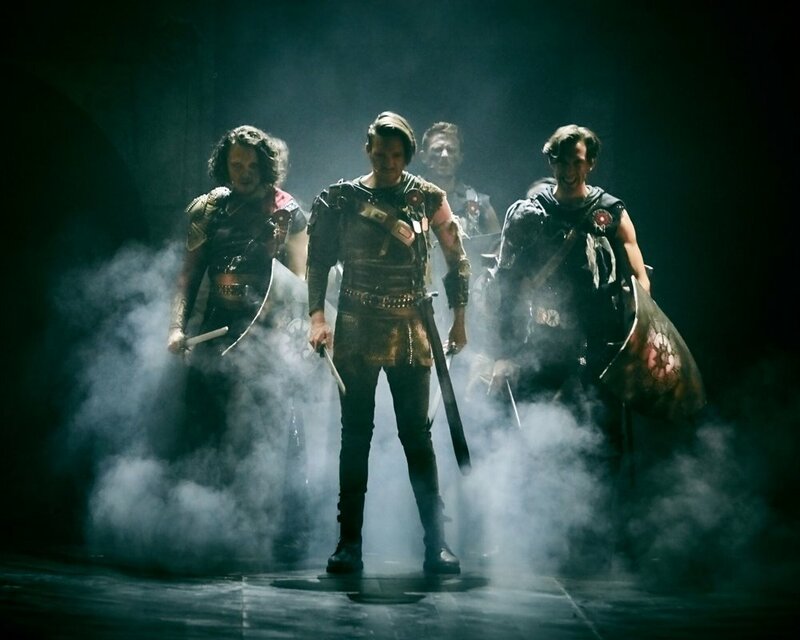 The show benefits from impressive use of sound and projection effects which add depth to the battle scenes and there’s even time for a little puppetry (think Warhorse on a budget). Knights of the Rose is, frankly, the sort of musical theatre that is very easy to take pot shots at and I’m sure many will. The original literary/musical mash up idea is a bit bonkers, but the RGM team found Knights of the Rose to be a really good fun experience, so If you’ve previously enjoyed Bat out of Hell –The Musical, or your idea of a great night out is Rock of Ages meets Game of Thrones, then Knights is pretty much essential viewing and with tickets starting at around £15 really great value. Knights of the Rose is at The Arts Theatre until August 26th, 2018.